The weather forcast didn’t tell a lie!! It was cloudy in the moring but we got a sunshine in the afternoon. I took this picture when I went to Shimoda for shopping. In this season there are many people who swim here. 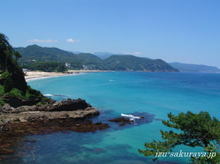 This entry was posted in beach on 2007年6月23日 by izusakuraya. This morning I went to the beach very early. 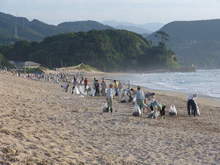 Every 2 month we, local people go to the beach in early morning on 2nd Sunday to clean. 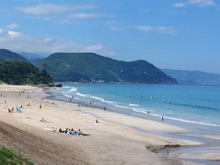 The cleanness takes place from 6:00 am, but the local people come to the beach at around 5:30 am. I think they wake up very early every morning. This entry was posted in beach on 2007年6月17日 by izusakuraya. "It wiil be almost rainy this weekend." But actually the weather has been changed it was beautiful day in Shirahama. In the rainy season we usually can’t see the shinning sea like this….. This entry was posted in beach on 2007年6月16日 by izusakuraya. Good Wave in Shirahama !! Today we had good waves in Shirahama. That’s why there were many surfers there. In June we don’t have good waves like this, but we will have "All Japan Student Surfing Championship" from June 15th. So I hope we have big waves like today. This entry was posted in beach on 2007年6月6日 by izusakuraya. 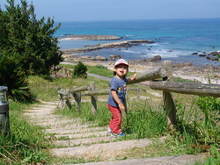 Today it was beautiful day, so I went to the beach with my son to take a walk. This is "Shirahama Chuo Beach" next to Shirahama Ohama Beach. After parking our car at the parking lot near the beach we started to walk. Yes, I was going to a secret cave in Shirahama……. 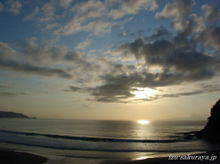 This entry was posted in beach, nature on 2007年6月4日 by izusakuraya. This morning I went to the beach to take pictures of sunrise in Shirahama. When I got to the beach there had already been some people. But it was very silence and I could take many sunrise’s picture today. This entry was posted in beach, nature on 2007年6月3日 by izusakuraya.